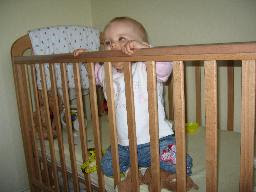 9 month old babies can start to pull to a stand and cruise on furniture. The world is a great big playground and they are starting to discover new things. They will try to put everything in their mouths. Some babies will be crawling all over the place at this time. They will be grabbing objects using a pincer grasp. They love to play peek-a-boo. They will start to imitate speech and they understand "no" and "bye". They can say mama and dada randomly. If you build a bond with them they will start to show stranger anxiety. Hopefully by this time your house is fully childproofed.